Described as a "Grecian relief with kneeling figure" (Nairn and Pevsner 363), this is a memorial to Isaac and Charles Smith, their nephew Isaac Gragg (later Cragg Smith), and his wife Caroline (see Green 8). It was the gift of Captain Cook's widow, whose mother was a Smith, and who often stayed with her cousins in Merton (see Robson). 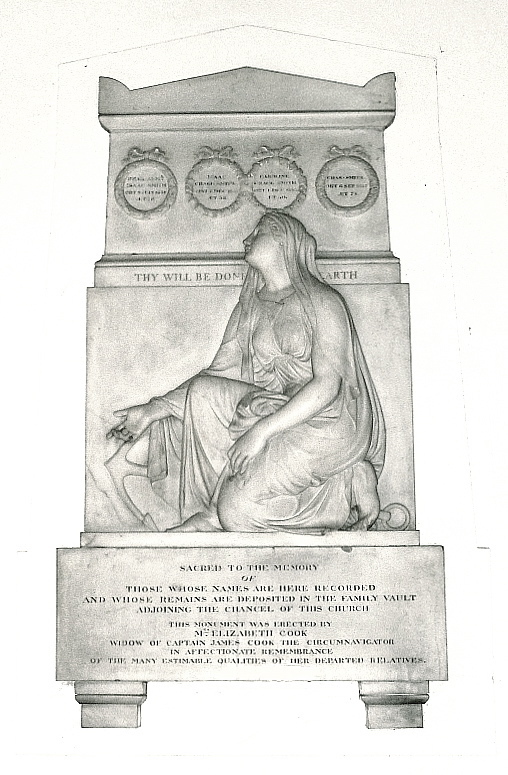 It is inscribed: "In affectionate memory of the many estimable qualities of her departed relatives." As the inscription also says, the Smiths' family vault adjoins St Mary's chancel. Photograph, commentary and formatting by Jacqueline Banerjee. The memorial is signed by R. J. Wyatt and dated "Rome 1832." He too was connected with Merton and the Smith family. His father Edward had bought a house in Merton in 1813, where he was still living in 1832, and his daughter Caroline, the sculptor's sister, had become Isaac Cragg's wife, commemorated here. She had died in childbirth before her husband had inherited the Smiths' estate and changed his name to Smith (see Goodman 16). The sculptor is thought to have modelled the female figure on her (Mee 217). When Edward Wyatt died in 1833, he was buried in the Wyatt vault next to the Smiths. The two vaults are side by side against the chancel's outside wall. Like the Wyatts, who were prominent in architecture and other branches of the visual arts, the Smiths had a distinguished family history. The older Isaac Smith had accompanied his cousin Captain Cook on two of his voyages, and was the first Englishman to land on the Pacific coast of Australia. He became a Rear Admiral. The seafaring connection is suggested by the anchor in the background here. Goodman, Judith. "Richard James Wyatt — 'Accomplished Sculptor and Excellent Man.'" Merton Historical Society Bulletin No. 166 (June 2008): 15-16. Web. 1 January 2013. Green, Lionel. St Mary the Virgin Merton Park: A Guide and History. 2005. Available at the church. Nairn, Ian, and Nikolaus Pevsner. The Buildings of England: Surrey. 2nd ed. London: Penguin, 1971. Print. Robson, John. "The Origins of Elizabeth Cook." Captain Cook Society. Web. 1 January 2013.